Events include everyone in the Fatima community and keep Our Lady’s banner flying! Our Lady’s Apostolate is always involved in planning or executing a conference, Rosary Rally, Web interview, Rapid Response Team deployment or other events. These events play a vital role in the apostolate’s mission to make the Fatima Message known, loved and obeyed. First, they bring together those who are able to participate in person in the particular initiative. Each event has its own character and momentum, which becomes embodied in those who are present and who carry it forward with them into their families, parishes and communities. The event creates its own ambassadors who communicate the message to others. 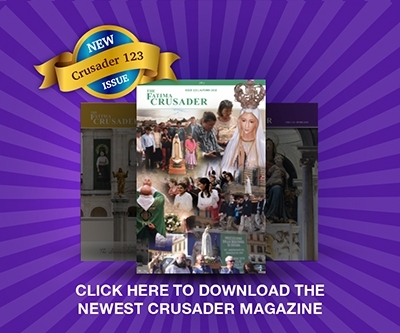 Second, each event is showcased either on the Web site or in The Fatima Crusader, so that all who support the apostolate can participate indirectly. Those who support the apostolate by their prayers and donations can see the work made possible by their dedication and generosity. Third, and very importantly, these events keep Our Lady’s Message alive in a world determined to silence it. They are like a banner raised on a battlefield where the enemy believes it has vanquished the truth spoken at Fatima. We proclaim, by our public presence, that Our Lady’s Triumph is coming and that we will never retreat in our campaign to hasten that Triumph. See our current events here!